I have been a dancer for my entire life. Until recently, I thought dance and math would have to be disjoint passions in my life. However, thanks to the inspiration of Science Magazine’s "Dance Your PhD" competition, I have found a way to blend math and dance together into a cohesive art. Over the summer of 2017, I worked with Alex Nye to make the winning video for the 2017 "Dance your PhD" competition. Since then I have choreographed and performed a live Math-Dance titled Tensegrity, and given "performative lectures" using aerial dance to teach knot theory. Why Dance? So much of the language of mathematics describes actions, twists, flows, changes, mappings, continuous deformations; all of which have a technical meaning, but describe movement. Dance is a stunning and novel choice of expression to communicate these ideas of movement. I also believe that dance is a way to empower women to feel comfortable and important in the STEM fields. This film is an artistic expression of the creator's PhD thesis using aerial and contemporary dance. 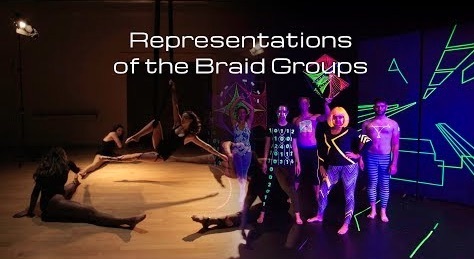 The story follows a dramatic adventure as braids are translated into matrices all while describing the basics of representation theory and the braid groups. This film won Science Magazine's 2017 international "Dance Your PhD" competition, was an official selection for the Raw Science Film Festival, and won honorable mention in the Art Of Science competition at UC Santa Barbara.